Once upon a time there was a pork chop: nearly two inches thick, moist with tiny interior seams of fat, seared in butter in a heavy copper skillet; then a splash of Calvados deglazed the pan, and it gently braised until it was the color of burnished cherrywood. It arrived on the plate attended by fried sage leaves, tiny new potatoes and al dente green beans. On the fork, it was silken, more tender than a prime filet, and to the tongue it delivered extreme unction, an expatiation of carnivorous sins, a path straight to gustatory nirvana. Oh dear. There I go, getting sentimentally involved with my dinner again. In this case, however, nostalgia is appropriate. Pork of that quality is no longer available to you or me, except in high-end restaurants and steakhouses, where a chop can set you back $45. And it will almost never be as good. We are, historically, a pork-fed nation. The pig was the ideal meat animal for the colonists; it required little care, could be a disposal for kitchen waste, foraged for itself in the woods and prospered on the corn it was fed while being fattened for slaughter. When butchered, it provided an amazing number of foods. Choice cuts were smoked or cured; ribs were roasted, belly made into bacon; liver, tongue and brain were often eaten fresh; and most everything else made into sausage, with the skin of the small intestine used as casings. Excess fat was rendered into lard, the kind your great-grandmother used to make flaky piecrusts. (Slaves even found a use for the whole intestine: chitterlings.) In the 1830s, Harriet Martineau, visiting from England, complained that there was "little else than pork, under all manner of disguises." To a cook who grew up near the Mexican border, pork was the meat I found most versatile, in carnitas (slow sautéed chunks in lard, spiced with only orange rind), or chile verde (stewed with tomatillos, garlic and poblano chiles). "The new pork" has changed my cooking habits, and not for the better. Have you noticed that supermarket pork is now lean and mean, but also flavorless and dry? How did this happen? The tale is cautionary, showing just how much we are pawns not only of skillful PR and industrialized agriculture, but also of fads and trends and pseudoscience, as well as our all-American cultural expectation to live forever young, thin and gorgeous. Our story begins with a decades-long national paranoia toward calories from fat, fueled by the connection between saturated fats and cholesterol. We are still in that mode, as tabloids and pop magazines obsess over anorexic starlets, jeer at normally proportioned women as "fat," and promote an infinite number of magical fad diets. The idea of temperance or moderation -- that one can enjoy eggs or cheese or ice cream occasionally without risking cholesterol overload, diabetes or obesity -- seems, for many Americans, impossible: It's all or nothing. In the early 1980s, when diet mavens began to change their focus from calories to fat content, chicken breast became de rigueur in processed foods as well as in restaurants. To this day, you cannot find chicken thigh meat in most restaurants or in most commercial food products, even though every chef knows it is more flavorful. Pork was the next target (bacon! spare ribs! ), and sure enough, consumption plummeted. In 1987, The National Pork Board decided they needed to "reposition" their product. They began a campaign advertising pork as "the other white meat," largely based on public perception of chicken and turkey breast as more healthful than red meat. The campaign was a success: Today, 87 percent of consumers are said to identify pork with the slogan. However seductive the dietary imperatives may seem, we can't live without fat. Aside from caloric energy, fat carries flavor and succulence. "Umami," the mysterious but scientifically established fifth basic taste sense, is closely related to fat. And fats satisfy. They break down in the digestive tract slowly, so they keep us fuller longer. Fat also affects the texture of meat. But in the late 1980s, saturated fat was anathema. And since pork was higher in calories from fat, large-scale pork producers needed a strategy for raising low-fat animals -- this they accomplished with selective breeding, standardized feeding and a controlled environment, which would maximize the amount of lean meat in the shortest time. Hogs were thus selectively bred to reduce body fat (some fatter breeds have become extinct). Their body fat, which in nature would provide insulation from heat and cold, became irrelevant, since they would never leave confinement. Feed had to be standardized. Where in nature piglets suckle for up to 12 weeks, in intensive production they were weaned after 17-21 days, and fed to put on as much lean weight as possible in the shortest possible time. Sow's milk has a fat content between 5 and 6.7 percent. Purina's "Pig Startena Line," however, contains just 3.5 percent fat, not a formula for healthy growth, in either pigs or humans. 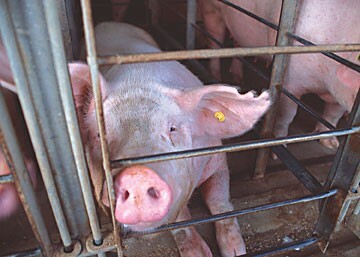 "Commodity" pork was increasingly produced by factory farms. The animals spent their lives indoors, packed together in mammoth, temperature-controlled, ventilated sheds, in pens with slatted concrete floors, with little room to move, their dung falling into waste channels below. This congestion led to the routine use of drugs to help prevent the spread of disease. Much U.S. raised livestock eats feed with antibiotics added to it, a practice known as "sub-therapeutic antibiotic treatment." In 2005, Pete Wells wrote in The Oxford American of a visit to a barn/factory in Western Kentucky: "Each sow was locked inside metal ribs about four feet high. This enclosure gave her enough room to lie down on one side, stand up, and lie down on the other side." Of course, the sow could not rotate at all. Her head was always in one direction; she could move forward and back perhaps two feet, but not turn around, an arrangement that prevented her from rolling over and killing her offspring. In nature, the crushing weight of the sow and her propensity for rolling around naturally thins the size of the average litter to a number that can comfortably feed. That was now impossible. Wells observed, "What evolution seems willing to tolerate modern agriculture cannot abide." Thus factory farmed sows have huge litters, which leads to intense competition for milk. Shortly after birth, the piglets' teeth are clipped to prevent damage to the sows' teats, and their tails are docked, because in adolescence the stress from close quarters leads to tail biting. Then there is the smell of the plant, a staggering brew of ammonia and hydrogen sulphide. Wells described the odor: "We had walked into a wall of stench. It stopped us flat." The producers had achieved their goal of leaner pork. But leanness brought other problems. The producers realized that their pork was dry. To address the problem, they turned to "enhanced pork" -- injecting the meat with brine and sodium phosphate, at the same time adding weight in the form of water. Water helps the meat avoid "shrinking" in the package, but does nothing for it in the pan, nor in the mouth. The result in the meat case is pale, pinkish flesh, each cutlet a clone of nearly tasteless, perfectly proportioned symmetry. Does taste matter? This is not a rhetorical question -- some consider the absence of flavor to be a necessary sacrifice, "collateral damage" to a larger social or moral agenda. Tofu, for instance. Try as I may (and I've had it in every possible variation), I can't find any flavor there. Is this the future of cuisine?